Botanical Name: Raphanus sativus (syn. : Raphanus chinensis, Raphanus gayanus). 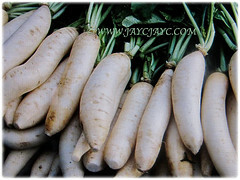 Common Names: Chinese/Japanese White Radish, Oriental/Cultivated Radish, Giant White Radish, Daikon, Lobak Putih in Malay. 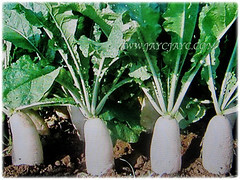 Etymology: The genus name, Raphanus is derived from the Greek words ra, meaning quickly and phainomal, meaning to appear in reference to the rapid germination of radish seeds. The specific epithet sativus means cultivated. 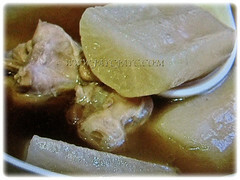 Origin: Native to Southern Asia. 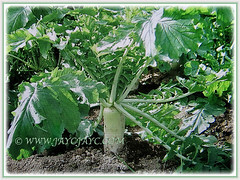 Plant type: An annual or biennial plant with an edible root vegetable. Features: Raphanus sativus is from the genus Raphanus that consists of 3 species of flowering plants. It’s an annual or biennial crop grown for its swollen tap roots which can be globular, tapering or cylindrical. It can grow up to 0.61-0.91 m tall and spread 0.30-0.61 wide. There is great variation in size, shape and colour. The round varieties are the size of a baseball. The root skin colour ranges from white, pink, red, purple, yellow and green but the flesh is normally white. Smaller types have a few leaves about 13 cm long with round roots up to 2.5 cm in diameter or more slender and long roots up to 7 cm long. 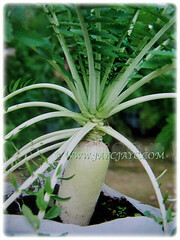 A longer root form including the Oriental Radish or Daikon grows up to 60 cm long with foliage about 60 cm and a spread of 45 cm. Leaves are arranged in a rosette. They have a lyrate shape, meaning they are divided pinnately with an enlarged terminal lobe and smaller lateral lobes. Simple leaves are made up of 2 or more discrete leaflets, lobed or unloved but not separated into leaflets. 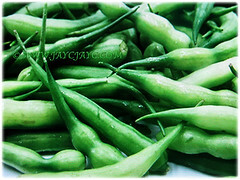 They are alternately arranged with one leaf per node along the stem. The white to pale violet flowers are borne on a racemose inflorescence. The flower is radially symmetrical with 4 petals and sepals in the flower. Both the petals and sepals are separate and not fused with 6 stamens. 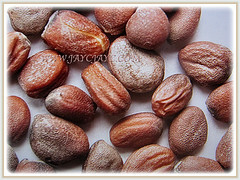 Eventually, the flowers will be followed by indehiscent fruits that do not split open when ripe to reveal the brown coloured seeds. The length of the fruit is 1-25 cm. 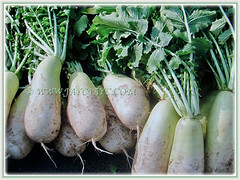 Culture (Care): Raphanus sativus or Chinese White Radish can be easily grown with least maintenance. Light: Best in full sun but will grow in semi-shade too. Soil: Sandy or loamy soils. Keep well fertilised and watered to ensure mild flavour and tenderness. Harvest when young before radishes bolt and become woody. Generally free from serious garden pests and diseases. Nonetheless, do watch out for flea beetles and other pests typically found on Brassicaceae crops. 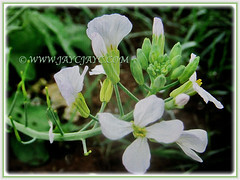 Raphanus sativus or Chinese White Radish prefers cooler weather and has a tendency to bolt or flower early in warm and hot weather. 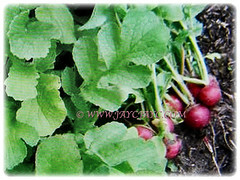 Harvest when young before radishes bold and become woody. The edible and succulent roots can be harvested in 8-10 weeks and be stored in the refrigerator for a couple of weeks if washed and dried and the leaves cut off. Cold weather makes them sweeter. Radishes will not produce pods when temperatures fall below 7.22°C, thus plant them in spring for late spring and early summer harvest. Propagation: Easily propagated from seeds that will germinate between 3-7 days.